Coming off two straight division titles, the Houston Texans were bit hard by the injury bug in 2017, limping to a 4-12 record. While Deshaun Watson tearing his ACL after a captivating stretch was a major blow to the offense, the defense was hit even harder. J.J. Watt and Whitney Mercilus played less than 430 combined snaps before being lost for the year. While Watt’s reputation is set in stone, Mercilus had been very productive in his own right with an overall grade of 85.0 or higher during the 2015 and 2016 seasons. The good news for the Texans is two stars emerged in 2017. 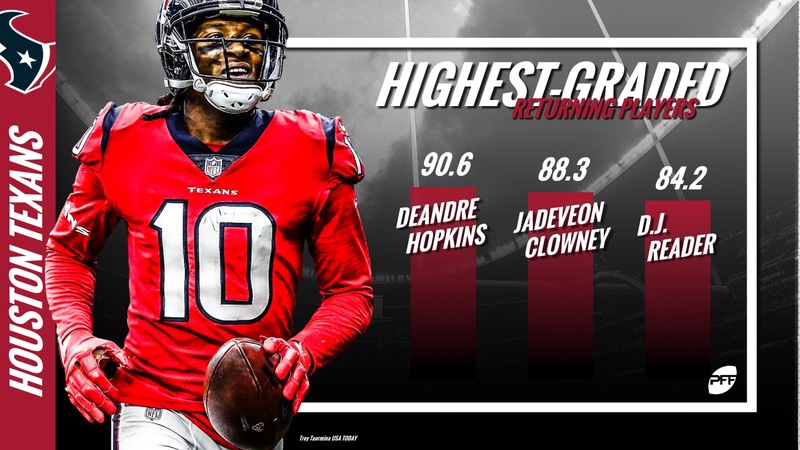 DeAndre Hopkins showed his 2016 was the outlier and finished with an overall grade of 90.6 that was fourth best among wideouts. Former No. 1 overall pick Jadeveon Clowney had his highest-graded season to date off the edge finishing with an overall grade of 88.8, and his pass-rush productivity of 10.3 was also a career high. 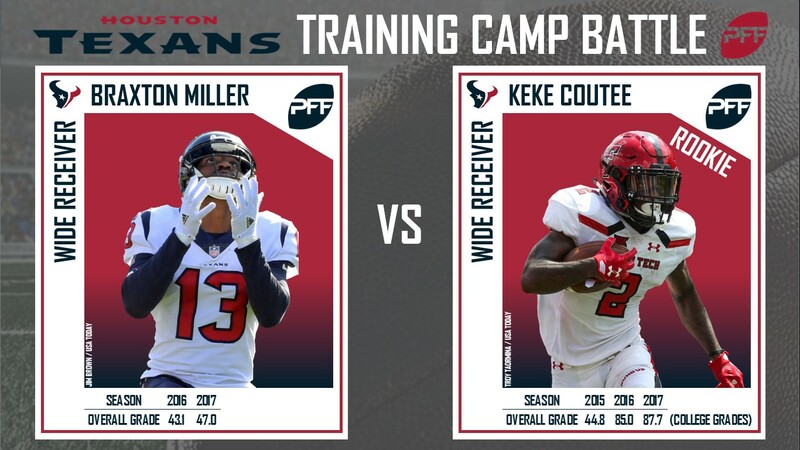 While the AFC South is arguably one of the league’s stronger divisions, the Texans, with the return of their young quarterback and two defensive cornerstones, should be more than competitive in 2018. Graded 30th overall among qualified signal-callers, PFF’s 2018 QB Annual highlights possible concerns about the volatility of Watson’s attempts. With a big-time throw percentage of 7.49, Watson led all qualifying quarterbacks. On the other end of the spectrum, his turnover-worthy play percentage of 4.49 ranked 33rd among 41 qualifiers. A full season of Watson would obviously be an upgrade at the position for the Texans, but those stats will be worth following throughout his second year in Houston. After being one of the league’s premier corners in the slot last year, Aaron Colvin signed a four year deal with the Texans this offseason. By joining the Texans, Colvin will have the chance to play on the outside which he did in spurts with the Jacksonville Jaguars before they brought in Jalen Ramsey and A.J. Bouye. In 2015, Colvin played over 200 coverage snaps on the outside and for the season allowed 1.09 yards per coverage snap which ranked 33rd among qualifying corners. The biggest question surrounding Colvin will be how he adjusts to a Texans defensive scheme that will be a change from what he played in the past four years. With key players returning from injury, the additions of Colvin and Tyrann Mathieu to the secondary, and the league’s easiest schedule by opponent’s 2017 win percentage, there’s reasons for Texans fans to be optimistic.